Cocaine is an alkaloid drug derived from the leaves of the coca shrub. A commonly abused illegal drug, cocaine has limited medical uses, most often in surgical applications that take advantage of the fact that, in addition to its anesthetic effect, it constricts small arteries, lessening bleeding. There are many street names for cocaine, including coke, C, toot, flake, and snow. Cocaine blocks pain sensation and stimulates the central nervous system, producing a sudden increase in heart rate, temperature, and blood pressure. In the brain, it blocks the synaptic reabsorption of certain neurotransmitters (in particular dopamine). The resultant buildup of neurotransmitters causes pleasurable sensations to be passed along the neural pathways over and over again, creating a feeling of profound well-being, self-confidence, and alertness. It is accompanied by lack of hunger. The effect lasts for 10 to 30 minutes, and the user begins to crave more immediately as the neurotransmitter supply is exhausted. This pattern has led to cocaine's being described as "neuropsychologically addicting" in recognition that traditional definitions of physical vs. psychological addiction do not neatly fit in this case. Most cocaine addicts in treatment report some control over their use for the first two to four years, giving them the illusion that addiction will not develop. Cocaine is a potent central nervous system stimulant. Its effects can last from 20 minutes to several hours, depending upon the dosage of cocaine taken, purity, and method of administration. With excessive dosage the drug can produce hallucinations, paranoid delusions, tachycardia, itching, and formication. Cocaine raises the amount of dopamine and serotonin in the nucleus accumbens; the "crash" experienced after the initial high is marked by an undershooting of normal levels afterward. This is because neurons run out of dopamine and serotonin neurotransmitters. Receptors disappear as a response mechanism to too much neurotransmitter. This contributes to the rise in an abuser's tolerance thus requiring a larger dosage to achieve the same effect. The lack of normal amounts of serotonin and dopamine in the brain is the cause of the dysphoria and depression felt after the initial high. The diagnostic criteria for cocaine withdrawal is characterized by a dysphoric mood, fatigue, unpleasant dreams, insomnia or hypersomnia, increased appetite, psychomotor retardation or agitation, and anxiety. Cocaine addiction is the obsessive or uncontrollable abuse of cocaine, and can result in physiological damage, lethargy, depression, or a potentially fatal overdose. Many habitual abusers have been diagnosed with a manic condition similar to amphetamine psychosis and schizophrenia, whose symptoms include aggression, severe paranoia, and tactile hallucinations (including the feeling of insects under the skin, or "coke bugs"). Cocaine has positive reinforcement effects, which refers to the effect that certain stimuli have on behavior. Good feelings become associated with the drug, causing a frequent user to take the drug as a response to bad news or mild depression. This activation strengthens the response that was just made. If the drug was taken by a fast acting route such as injection or inhalation, the response will be the act of taking more cocaine, so the response will be reinforced. 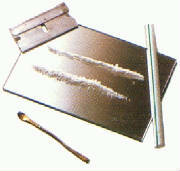 Powder cocaine, being a club drug is most commonly available in the evening and night hours. Because cocaine is a stimulant, a user will often drink large amounts of alcohol during and after usage or smoke marijuana to dull the effects to help one achieve slumber. These several hours of temporary relief and pleasure will further reinforce the positive response. Other downers such as heroin and various pharmaceuticals are often used for the same purpose, further increasing addiction potential and harmfulness.